The 1998 Chargers had a dominating defense led by Pro Bowlers Junior Seau and Rodney Harrison, yet couldn't win games because of the worst quarterbacking in NFL history. Whelihan had the eighth-worst quarterback season since 1960 and wasn't even the worst quarterback on this team. Whelihan never played in the NFL again, but he resurfaced in 2001 when the Memphis Maniax took him in the 41st round of the XFL draft. (Admit it, you had no idea the XFL draft even had 41 rounds.) Believe it or not, he's still around as the backup quarterback for the Arena League's Las Vegas Gladiators. The 1998 Arizona Cardinals were one of the great flukes of NFL history, going 9-7 despite being outscored by opponents 378-325. In the 1999 Stats Inc. "Pro Football Scoreboard," writer Tony Nistler declared that Plummer would lead the Cardinals to the Super Bowl someday and called him a player who "has eaten pressure for lunch." Clearly, pressure gave Plummer indigestion, because his game completely collapsed in 1999 despite the addition of eighth overall draft pick David Boston to his receiving corps. Unlike the other quarterbacks on this list, Plummer was able to recover from his historically awful season, even returning to the playoffs after signing with Denver in 2003. Kapp won two Grey Cups with the British Columbia Lions before coming down to the NFL and leading the 1969 Minnesota Vikings to the Super Bowl. They rewarded him with a trade to the Patriots, a team with three straight 10-loss seasons. Kapp enjoyed his struggles in Boston so much that he refused to sign the Standard Player Contract in 1971. He sued the NFL for antitrust violations and won -- only to have a jury decide he was not due any damages. Kapp's lousy year did give the renamed New England Patriots the first overall selection, which they used to replace Kapp with Stanford's Jim Plunkett. 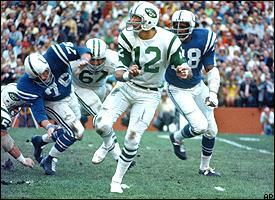 By 1976, Namath was a shell of the QB who led the Jets to victory in Super Bowl III. With his glory days five knee operations in the past, Namath completely fell off the cliff in 1976. With 7.0 yards per attempt in 1975, he was a below-average quarterback, but with 4.7 yards per attempt in 1976, he was an embarrassment. Figuring they had a good track record with quarterbacks out of Alabama, the Jets used their first-round pick on Richard Todd to be Namath's heir apparent. When Namath couldn't play because of his knees, Todd was just as bad, barely completing 40 percent of his passes with a similar 1-to-4 touchdown-interception ratio. Roll Tide!